Chickadees are the friendliest birds in the backyard. They can even be trained to eat from your hand, that is, if one has the patience to sit quietly while they are being encouraged. Chickadees are common throughout the US. Although there are three different types of this charming bird, they vary only slightly in appearance and are easily recognized anywhere. They frequent residential yards and gardens, devouring insects and visiting feeders. All the while these cute little perky and bright creatures liven up the neighborhood with their antics and their distinctive chick-a-dee-dee-dee call. Unlike many bird species where the male and female are easily distinguished by different colored plumage and the male does most of the singing, male and female chickadees look alike and sing alike. 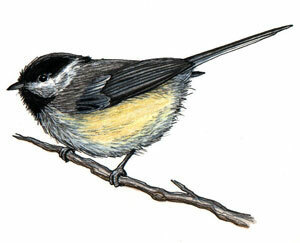 Chickadees are one of the quickest birds in the air, able to change directions in a lightning fast 3/100 of a second. Nine times out of ten, they are the first visitors to a brand new birdfeeder, having an unerring ability to find their favorite sunflower seeds. They are fearless and can even be trained to eat out of the hand of a patient yardener. Black-capped chickadees (Parus atricapillus) - have a black cap and throat, with white cheeks and buff-yellow sides. They are typically about five and one half inches long . They are very comfortable around humans and may become quite tame in your yard. Carolina chickadees (Parus carolinensis) - as the name implies, are found in the southern portion of the United States. They look very much like the black-capped chickadee except they do not have the white trim on their wings and they are typically an inch or so smaller than their northern cousins. Mountain chickadees (Parus gambeli) - are the same size as the black-capped, but the cap on the mountain chickadee is split by a white streak and their bodies are grayer than the black-capped. Their back feathers are slightly more brown rather than gray as is also the case with Carolina and black-capped chickadees.